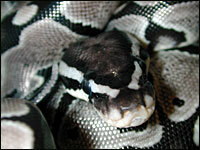 The Axanthic ball python has to be one of the prettiest ball pythons as a baby that I have ever seen. The way the silver/blue highlights the contrasting black and white is truly AWESOME!......These snakes lack most yellow coloration/pigment.....because of this.........they do not have the normal brown appearance of a normal ball python. When you breed and Axanthic to an Albino you will produce babies that are double het for SNOW. Breeding the Double het babies back together will give you a 1 in 16 chance of producing a Snow Ball. Axanthic lacks the yellow pigment and Albino lacks all of the darker pigments...........so when you cross the two genes, they cancel each other out............leaving an almost white snake with pink eyes. A snow is homozygous for both the Axanthic gene and the Albino gene............everything you breed it to will produce offspring that are 100% double het for SNOW. Now that I have my Snow Ball project running with TWO MALES from to different lines.........I will begin breeding the Axanthic gene into other types of mutations...........like a Hypo/Ghost and a Platinum........I really can't think of any mutation in the ball python that would not benefit from being crossed with the Axanthic gene. Below are some pics of the Axanthics I have in my collection and some that I have produced.......also there are some pics of the Joliff and VPI Snow Balls..............it took an Axanthic ball python to make the Snow Ball "happen" and years of hard work............scroll over the pics to see the description.